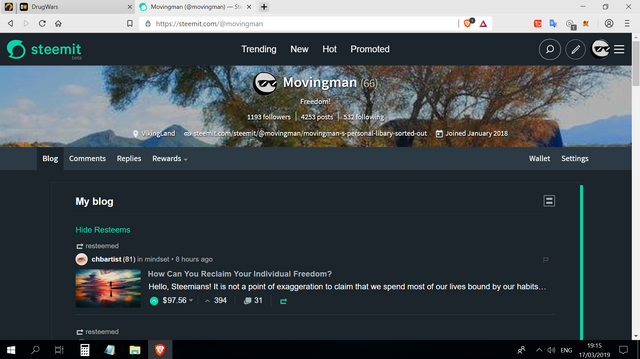 I just found this new look for Steemit, accidently hahahah! I just swapped to nightmode which I never even saw in the menu before, a kind of black theme instead of the normal white Steemit UI.. I kind of like it? It's been around for a while. Hope your doing good Mike! I've dark moded all my apps. The battery lasts longer and like you said, softer on the eyes. Especially mine since I have a heightened sensitivity to light. I could be wrong, but I think that only happens with AMOLED screens, which most phones do not use. This might give you a better answer. Regardless, darker screens require less power. Yep been using night mode almost since I started on steemit. Your UA account score is currently 3.555 which ranks you at #6301 across all Steem accounts. In our last Algorithmic Curation Round, consisting of 212 contributions, your post is ranked at #127.